A long-time sideman for the likes of Santana, the Dixie Chicks, Jewel, and Matthew Sweet, as well as an original member of the award-winning Robert Randolph and the Family Band, John Ginty steps out into the spotlight with his 2013 release, Bad News Travels. 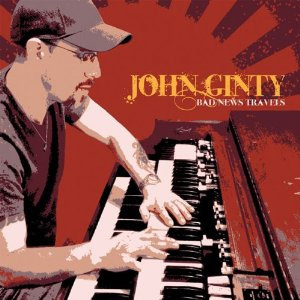 A creative musician, with incredible B3 chops, Ginty proves a more than capable bandleader, and has assembled an album that captures the earthy spirit of the Hammond B3. The album is a pleasure to listen to, and features a number of impressive guest artists, including Warren Haynes, Todd Wolfe, and Martie Maguire, Alecia Chakour, Cris Jacobs, Albert Castiglia and Neal Casal. Despite bringing in a number of guest artists, this is clearly Ginty’s record, and he has a consistent earthy and adventurous sound that ties all of the tunes on the record together. That being said, each of the guest artists add their own personality to the record. “Mirrors,” which features Warren Haynes on guitar, stands out as particularly notable among the guest performances, and Ginty seems to also have a special rapport with Florida-based blues guitarist and vocalist Albert Castiglia. In a genre dominated by guitarists and vocalists, it is somewhat unusual to hear an album that contains predominantly instrumentals, driven and led by a B3 player, but Ginty makes this critic wish there were more such albums being made. Too often, B3 parts are treated as pads and shoved in the background of screaming guitars, but Ginty shows the power and character of the instrument in a way that few players are able to. This is a very good album. All of the instrumentals are phenomenal, with the aforementioned “Mirrors,” along with “The Quirk” and “Peanut Butter,” standing out. Of the vocal tracks, Alecia Chakour’s guest appearance on “Seven & The Spirit” is simply haunting. The only weak track on the album is “Damage Control,” where the style changes. On that track, Ginty’s B3 part is secondary to his Wurlitzer, and the groove just isn’t quite the same. It is also Castiglia’s weakest performance. Guest fiddler Martie Maguire’s appearance on “Rock Ridge” is interesting. B3 and fiddle is a combination that can only be described as unique; it certainly is not bad, but also feels as though it needs another instrument to fill out the song. “Trinity,” featuring Cris Jacobs is a nice closer. While not one of the best tunes on the album, it is truly a perfect closing song to what can only be described as a very strong album by veteran bluesman John Ginty.